Fiber is the part of fruits, vegetables and grains not digested by your body. Fiber is essential in maintaining digestive system integrity and preventing chronic diseases. However, you may need to follow a low fiber diet if you experience cramping or diarrhea, suffer from bowel problems, have trouble digesting certain foods or have recently had surgery. A low fiber diet limits the amount of undigested material that passes through your large intestines and lessens stool bulk. There are a variety of low fiber fruits to choose from on a low fiber diet. A serving 15 to 20 grapes contains just 1 gram of fiber. Grapes are also rich in potassium, phosphorus and vitamins A, C and K. Green, black, purple or red grapes all make a low fiber, tasty snack. For a tropical treat, select pineapple. Whether fresh, frozen or canned, a one-half cup serving of pineapple has 0.8 grams of fiber. Pineapple is also rich in calcium, magnesium, potassium and vitamin C. Add it to other tropical fruits for a salad or use it to top off yogurt. Bananas are a mild tasting, low acidic fruit, often recommended if you have gastrointestinal distress. The amount of fiber in a banana depends upon its size. A medium banana contains approximately 2 grams of fiber, and a large banana provides closer to 3.5 grams of fiber. For the purposes of a low fiber diet, try to select small to medium sized bananas. Members of the citrus family, grapefruit and oranges are rich in the antioxidant vitamin C. Antioxidants help protect your body from oxidative damage. Free radicals are by-products of normal metabolism, sunlight exposure, cigarette smoking, pollution and high fat or high sugar diets. Free radicals, such as vitamin C, assist the body in balancing free radicals so that they do not cause damage. Grapefruit and oranges is therefore an excellent choice on a low fiber diet. A half grapefruit contains 2 to 3 grams of fiber and one small orange contains 3 to 4 grams of fiber. There are many different kinds of melon. The most common varieties are cantaloupe, honeydew and watermelon. On average, a one-half cup serving of either cantaloupe or honeydew contains 1.4 grams of fiber. A one-half cup portion of watermelon has 1.8 grams of fiber. Melon is an excellent low fiber snack that is cool and refreshing. Choose melon that is soft and well ripened. 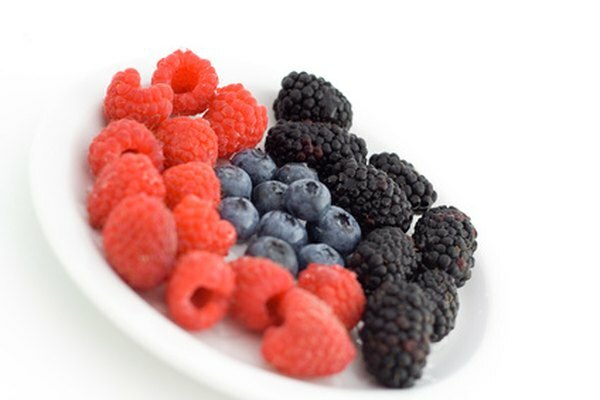 Berries come in a wide variety of colors, sizes, flavors and fiber content. On a low fiber diet, you should choose blueberries and strawberries. A 1 cup serving of strawberries has 3.3 grams of fiber and a 1 cup portion of blueberries provides 3.5 grams of fiber. Blackberries and raspberries contain more fiber. One c of blackberries contains 7.6 grams of fiber and 1 cup of raspberries has 8 grams of fiber. This does not necessarily mean that you have completely avoid them, you can eat them in moderation if they do not cause you discomfort.